The Big Lunch on 2nd June is part of the national Big Lunch and a chance to bring a picnic lunch to the farm and eat it in a traditional hay meadow amongst the butterflies, bees and wild flowers. If it rains we have a large barn available to eat lunch in. 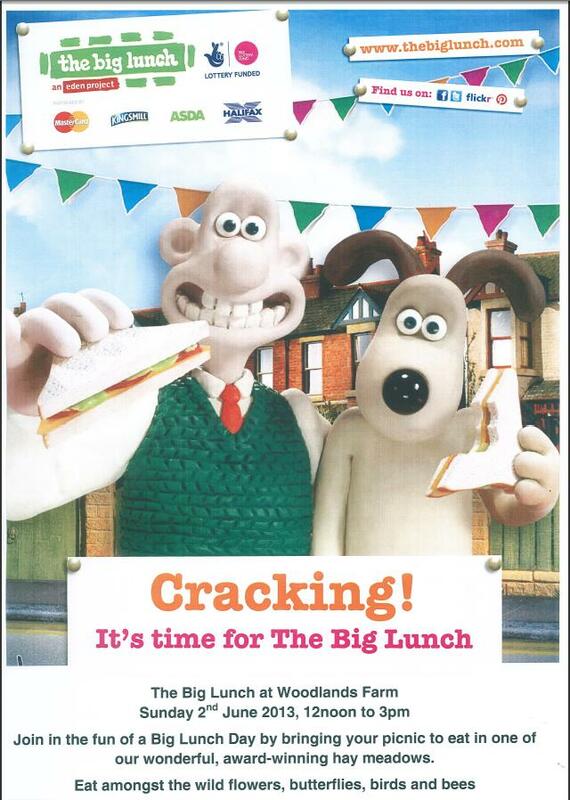 The idea for The Big Lunch originated with the Eden Project and is part-funded by the Big Lottery Fund. It started in 2009 with the aim of getting as many people as possible to have lunch with their neighbours once a year, helping to create more cohesive communities. Last year 8.5million people took part. 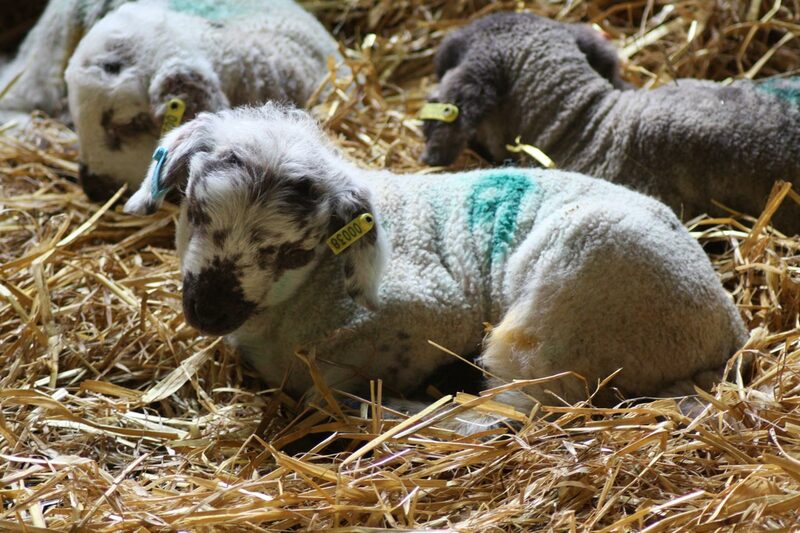 The second event is Open Farm Sunday on 9th June. This is the chance for the community to visit their local farm to find out how it works. 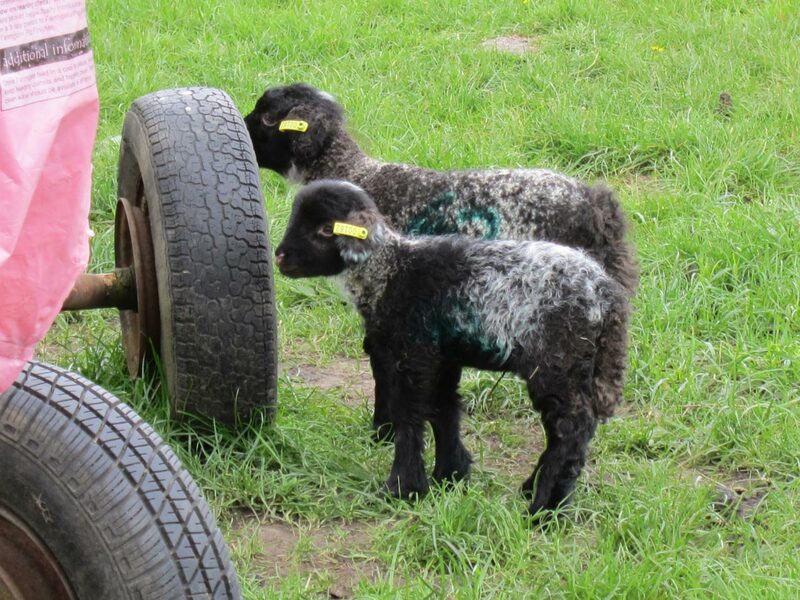 Because Woodlands Farm is focused on conservation and traditional low impact farming methods there will be lots of opportunity to take guided nature and birdsong walks, activities for children, meet some of our rare breed cattle, sheep and pigs, see machinery in action and much, much more! 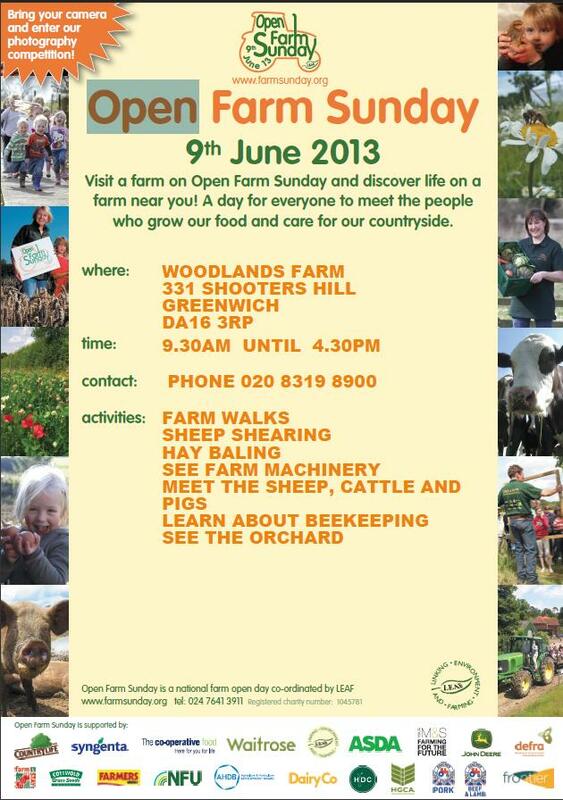 Open Farm Sunday was started in 2006 by LEAF (Linking Environment And Farming) and this year will see hundred of farms across the country open on the 9th, including Mudchute Farm and Stepney City Farm as well as Woodlands. 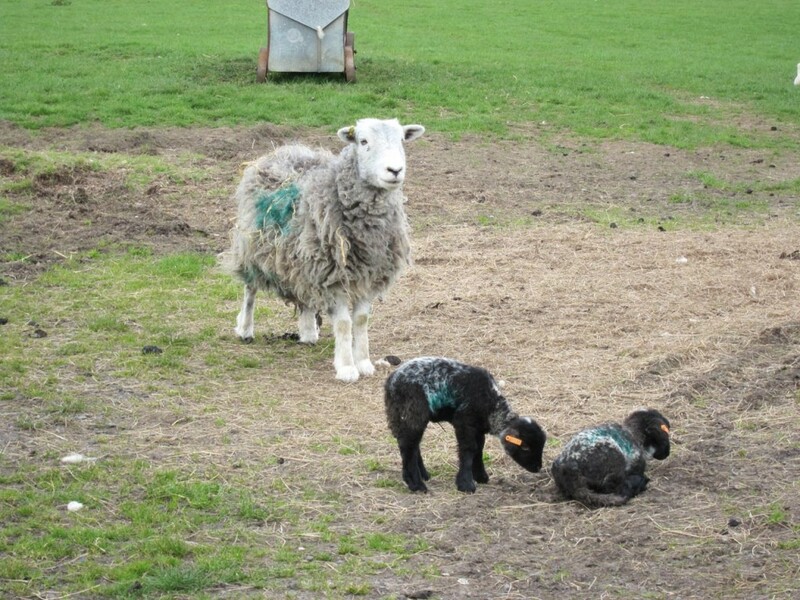 Woodlands Farm is open from 9.30am to 4.30pm. The Friends of Eaglesfield Park have launched a new blog to keep us up to date with what’s happening in the park, such as the recent pond dipping and tidying event. They mention that the next opportunity for pond dipping will be at the Eaglesfield Park Neighbourhood Watch Scheme 2013 Community Fête on Saturday 15 June between 1 and 4 pm, and that they are planning to hold a Parkfest Event on Saturday 13th July. I’ve added the new blog to the local links list on the right. Ian Bull has been in touch to let us know about two walks he is leading this weekend. Ian led the Midnight Megawalk on the Green Chain and the Best Landscape and Views in London walks mentioned in previous posts. … you will receive the almost magical experience of seeing the great river flow from salt water estuary to the heart of urbanity. The contrast really is exceptional for we’ll begin by Dartford Creek, famed for its birdlife and with barely a building in sight. Then the pre-esturine river, fringed by salt-loving flora and onto the post-industrial landscape of Woolwich and Charlton. Very gradually the office blocks of central London come into view with an ever improving sunset behind them. 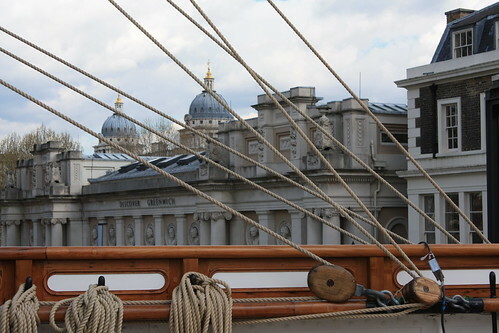 We finish besides one of the most famed examples of the built environment on the planet, Wren’s magnificent work at Greenwich. The Super Walk starts at 10.00am and is expcted to take about eight hours. Bring food to eat on the way as there may not be time for a fixed lunch break. If anyone wants to join the Thames walk today they can call Ian on 077 998 101 78 and he’ll tell you where they are up to. The Sunday walk is much more local being from Belvedere to Shooters Hill along the Green Chain. There’ll be a little diversion at Cleanthus Road as we’ll walk down the hill to Eltham Common to regain the Green Chain at Eltham Common. This will give us a chance to see Severndroog Castle and the views on the way round to the Oxleas Wood Café where the walk will end. On this walk hikers will pass through some stunningly beauriful ancient woodland – it includes Lesnes Abbey, Bostall and Oxleas woods. 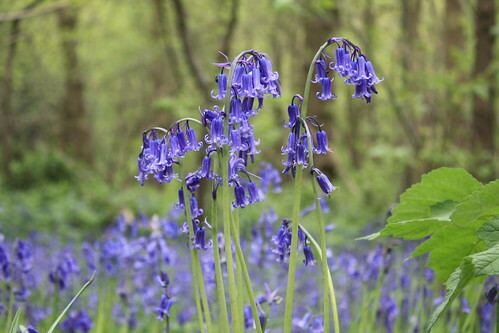 Perhaps there will still be some bluebells to see on the way. The walk starts at 1.00pm on Sunday 26th at Belvedere railway station. The walks are part of Walk London‘s “Spring into Summer” event. Both are free and there is no need to book. The walk leader, Ian Bull, can be contacted by e-mail, ianbull@btinternet.com or phone, 020 7223 3572 for more details. A petition has been started by Greenwich Councillor John Fahy asking the Mayor of London to stop the closure of Woolwich Fire Station. 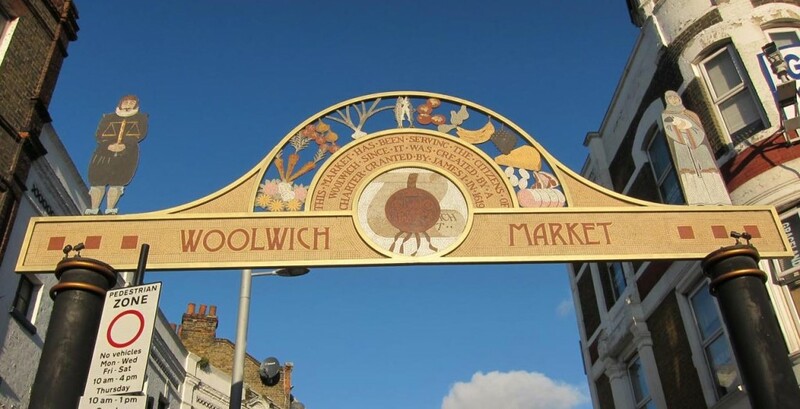 Woolwich is one of 12 stations that are proposed for closure across London as part of the Draft Fifth London Safety Plan which is currently out for consultation. In addition it is proposed that 500 fire fighters will lose their jobs and there will be 18 fewer fire engines. 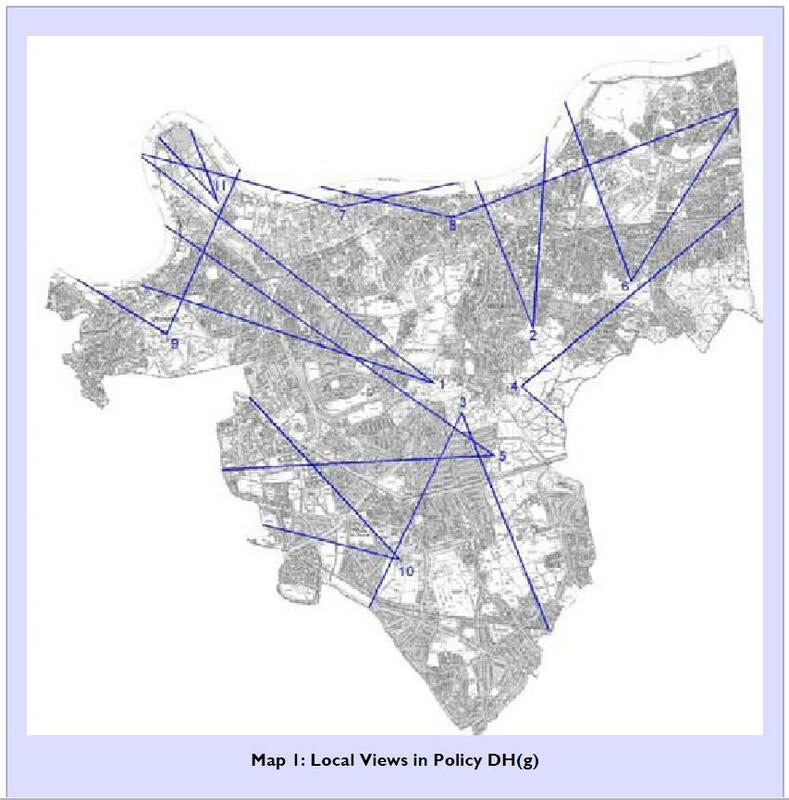 The new modelling indicates that 40 wards would move from within target to outside target as a result of the proposed reductions. However, those 40 wards would join 267 wards in London that are currently performing outside target. The target time for the arrival of the first appliance at a fire is six minutes. 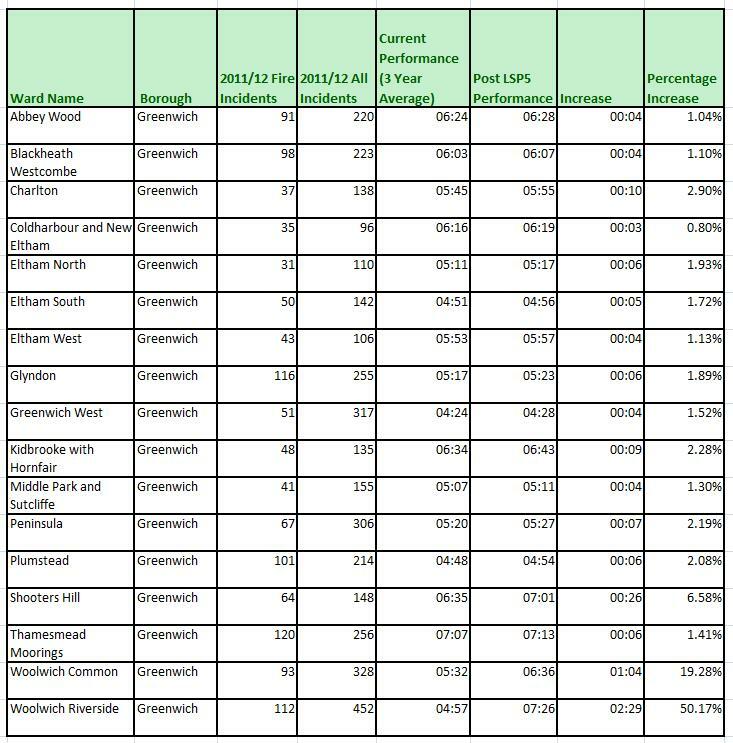 The first appliance figures for Greenwich wards are shown in the table below, together with the increases and the percentage increases. For Shooters Hill there is an increase in first appliance arrival time from 6 minutes 35 seconds to 7 minutes 1 second, an increase of 26 seconds, just over 6.5%. The new time is just over a minutes over target, or 17% over. It may not seem like much, but every second counts if your home is on fire. 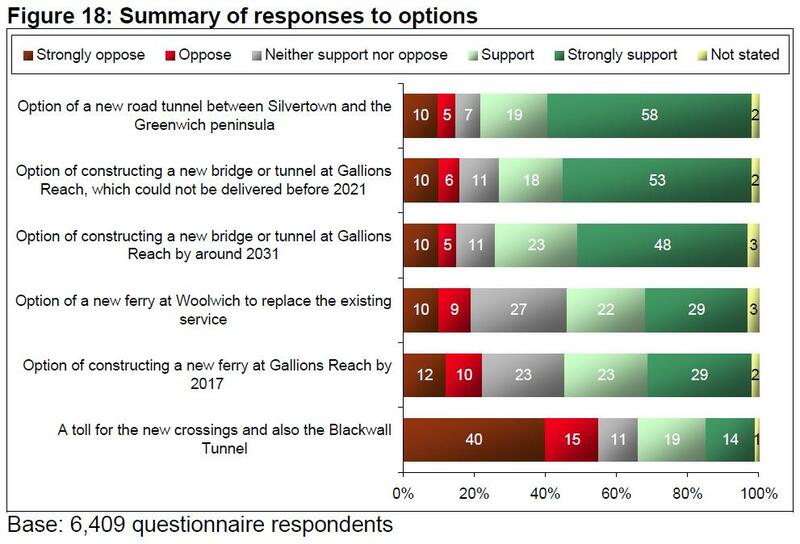 The worst impacts in Greenwich are in the Woolwich Common ward, where the response time increases by nearly 20%, and Woolwich Riverside with a huge 50% increase. Both these wards will no longer meet the 6 minute target after the change, whereas they do now. How can we make our opinions known? As well as signing the petition, there is the consultation on the Draft Fifth London Safety Plan (LSP5) which runs until the 28 May 17th June 2013 and we can express our views through an online survey. London Fire Brigade have also organised 24 public meetings in different boroughs to discuss the Safety Plan. In Greenwich this will be held on Wednesday 29 May from 7-9pm at Lecture Theatre 315, King William Building, University of Greenwich, 30 Park Row, Greenwich, London SE10 9LS. Seems a bit odd that it’s the day after the consultation ends. I get the impression that attendees at the equivalent meeting in Southwark were vociferously opposed to the cuts. I can’t imagine Greenwich will be less vociferous. 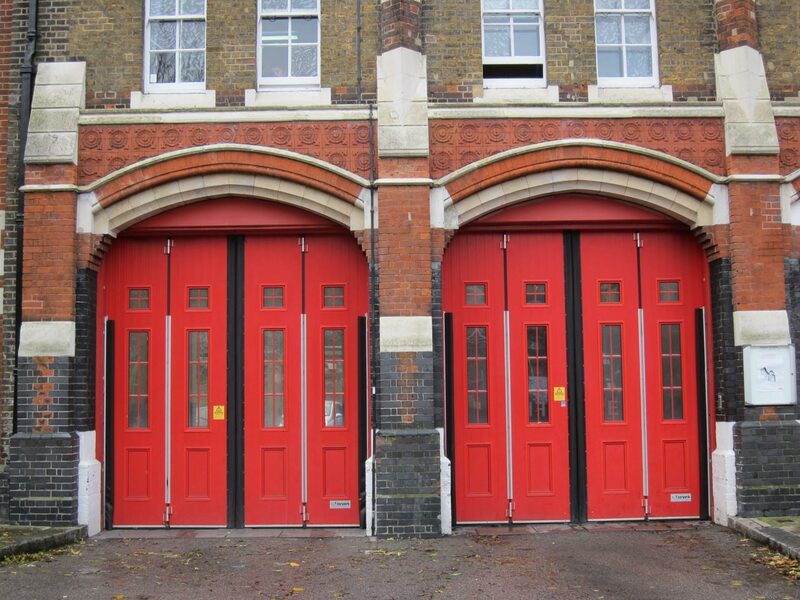 Woolwich Fire Station doors – to close for good? 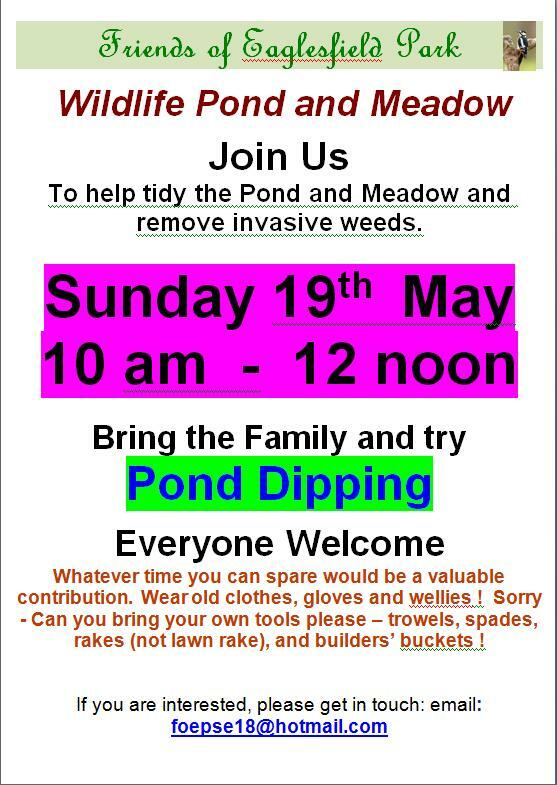 Madeleine from the Friends of Eaglesfield Park wrote with the latest news about the pond, and about a Pond Dipping event this Sunday, from 10am to 12.00 Noon. This will be combined with the first weeding and tidying session of 2013 for the wild flower garden around the pond. 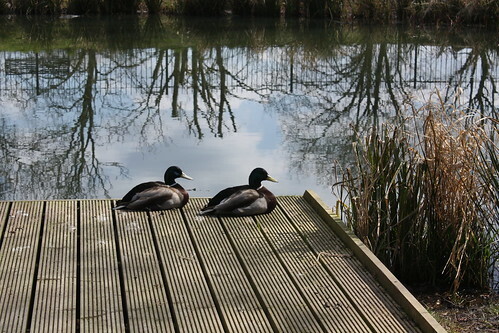 Finally Spring (and the sunshine) have arrived and we can continue the development and tidy up of the pond and meadow. The pond life seems to be flourishing, including newts, frogs, water boatman, water skaters, dragonfly with plenty of other interesting creatures we have yet to identify! The meadow has “greened up” well, but we need to reduce the invasive “weeds” and grass so that the wildflower seeds planted last year have a better chance of survival. We also have more seeds to sow and will be adding further plants. By now it is “old” news that there are up to a dozen ducks that regularly visit the pond. I also understand that bats have been seen hunting around the pond. We would like to thank everyone for their support and hard work in transforming this once forgotten part of Eaglesfield Park into a beautiful focal point for wildlife and the local community. We are meeting on Sunday 19th May between 10.00 am and 12.00 noon to carry out litter picking, weeding and planting and would very much appreciate your help – whatever time you can spare would be a valuable contribution. Sorry, but could you bring your own tools (spade, fork, trowel, builder’s bucket) and don’t forget to wear old clothes, wellies and gloves. 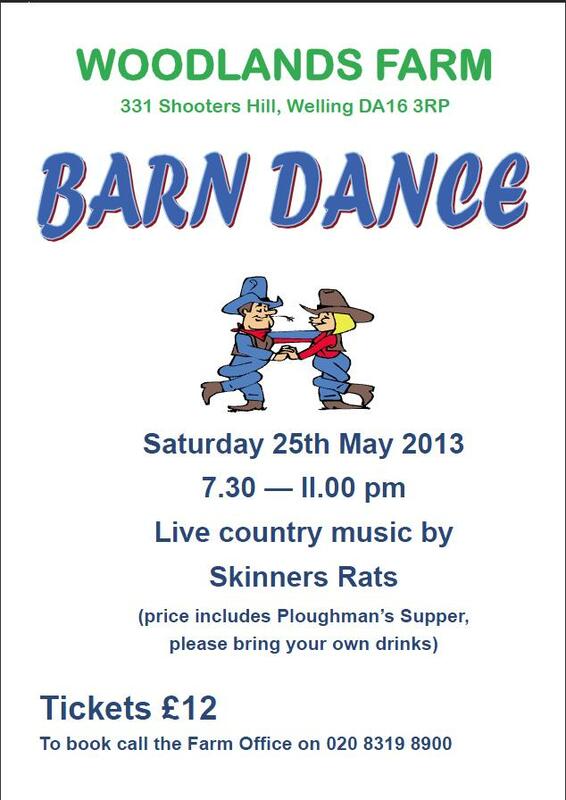 It won’t be all hard work though, we intend to have a bit of fun! We will be POND DIPPING as well. 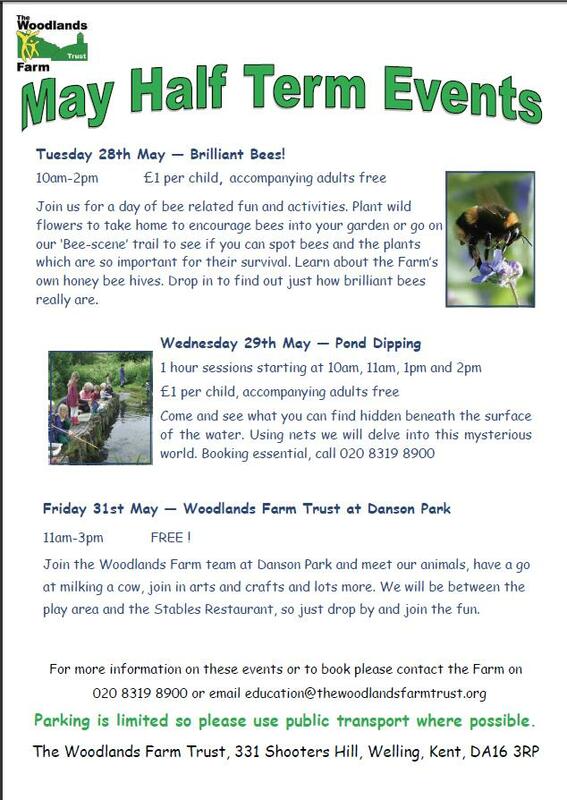 So, why not bring the family to try POND DIPPING and help identify the various pond creatures. We will supply pond dipping nets and information for identification. We do hope you will pop round to see us. – We are still working with Royal Greenwich and the Lottery Fund and hope to have new signage in and around the Park in the very near future. – IT access is currently being updated and we will keep you informed. Meanwhile, if you have queries or comments, I am happy to help. – We are in the early stages of planning park events. On a personal level, I have lived on Shooters Hill all my life and have been a member of Friends of Eaglesfield Park (FOEP) since it was set up in 2006. I remember the pond as a beauty spot that everyone visited but which over the years became overgrown, a dumping area and eventually a dried up scrub. In fact many people did not realise the pond had ever existed! I do hope you agree with me that the restored wildlife pond and meadow is a wonderful opportunity to study nature in a tranquil setting. If you would like to know how you can help the FOEP, please get in touch. We really could do with some extra help! The pond is looking good at the moment. 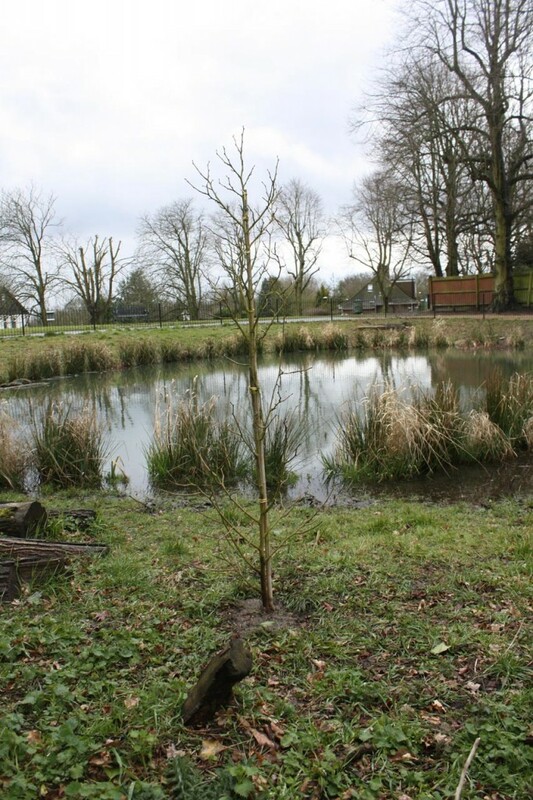 I notice that a new tree has been planted where the Mulberry that fell over during the pond work used to be. I hope it’s a replacement Mulberry! My sequence of pond pictures continues to grow, showing the changing seasons and weather. Bats are just amazing creatures; flying mammals that are superbly adapted to their nocturnal lifestyle. And much maligned – they are not vampiric blood-suckers, swooping down to latch onto a jugular vein. Admittedly a few Central and South American bats do feed on the blood of livestock such as pigs and cattle, but they lap up the blood coming from the cut they make in their prey’s vein rather than sucking it out. Even this has a good side: a drug has been developed from the enzyme in the bats’ saliva that prevents the blood clotting, which may, one day soon, be used to treat people who have had a stroke. A scientist with a sense of humour has called the drug Draculin. 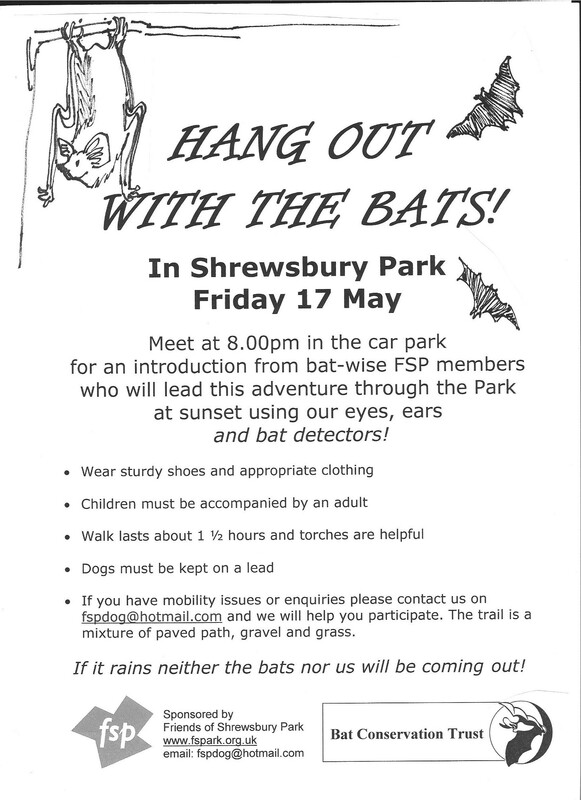 The Friends of Shrewsbury Park are bat lovers. Their bat walk has become an annual event, and the next one is on Friday 17th May, meeting at 8.00pm at the car park off Plum Lane. Last year’s walk took place on one of the few dry spring days, and attendees were rewarded with detection and sightings of a number of hunting pipistrelles. Hopefully the long, cold winter hasn’t had too much effect on the bats and this year’s walk will be similarly successful. 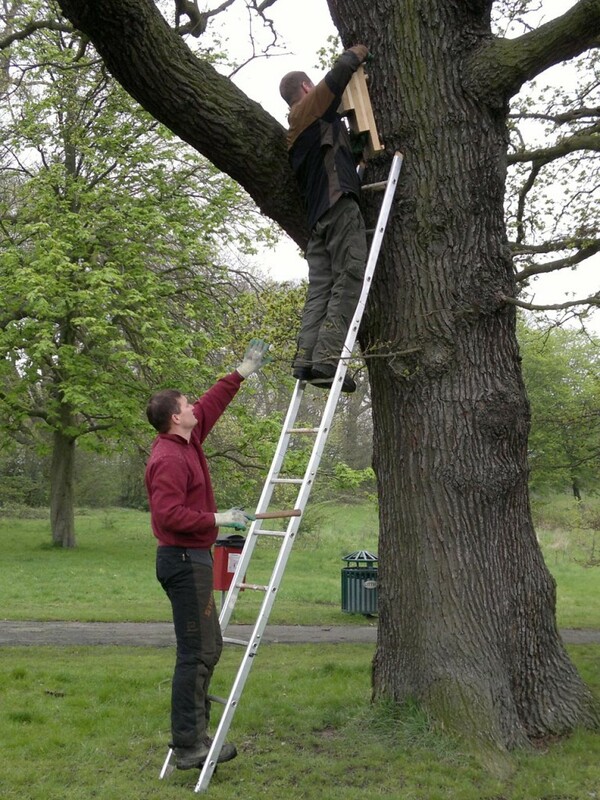 The walk will pass by the bat boxes the Friends constructed and, with council assistance, attached to trees in the park last year. Sometimes it is a year or two before boxes are inhabited, and bats move between different roost sites at different times of the year, so it will be interesting to see on Friday if the park boxes have any occupants. • Bats are not rodents, and do not gnaw at wood, wires or insulation. • All British bats consume insects and therefore their droppings are dry and crumbly, they do not putrefy like mouse droppings. • Bats do not nest and therefore do not bring bedding material or insect prey into roost spaces. • Bats are clean, and spend many hours grooming. • No species of British bat feed on blood. 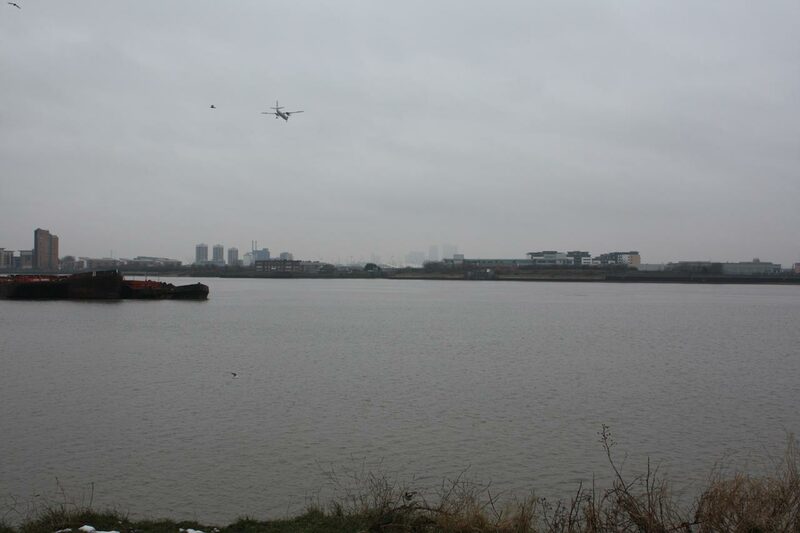 • To protect and enhance the present population through increasing the provision of roost sites in Greenwich. • To protect and enhance linear landscape features and wildlife corridors for bats to commute between roost and feeding sites. • To increase the abundance of insect prey available for bats. A good way to find our more about bats is to go along to the Bat Fest organised by the Bat Conservation trust and the Natural History Museum, which this year runs over the weekend of 1st and 2nd June at the museum in South Kensington. Volunteers from the London Bat Group will be on some of the stands. Last year it included various batty activities for children, some more detailed technical stuff about echolocation and a series of Nature Live talks. Also there was the marvellous Jenny Clark, a bat carer who has converted part of her home in Forest Row, Sussex into a bat hospital. She brought along some of the rescue bats that couldn’t be released back into the wild because, maybe, they were unable to fly or had been hand-reared from babies. 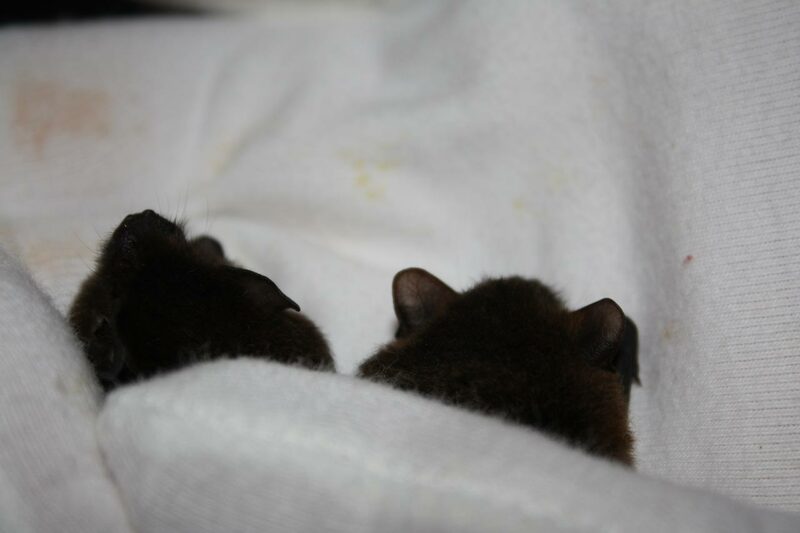 It was a rare chance to get close to live bats, and to learn how cute and fragile they are, and that they purr when stroked. If you share my fascination with batty matters, take a look at these Youtube videos of bats in action. First, on BBC’s Top Bat, a sequence showing Daubenton’s Bats hunting at Fountains Abbey in Yorkshire. I just love this video of the Long Eared Bat silently stalking moths using its hypersensitive hearing. THIS GIRL WENT TO MARKET – a young lady researches the history of Beresford Square market and finds her future (real life) husband. PLUMSTEAD MAKE MERRY – the preparation for this popular local festival and the many aspects of how people enjoyed themselves at the two day event on Plumstead Common. INN AT THE TOP – the archaeological search by members of the Shooters Hill Local History Group and friends for the “Catherine Wheel” ale house at the crest of Shooters Hill, which predated the “Bull” as a stop for stage coaches on the road to Dover. 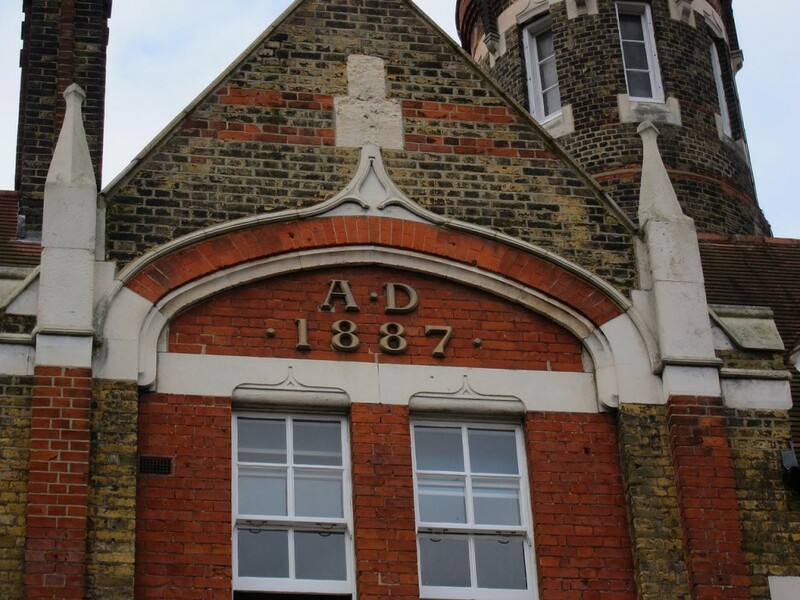 Meeting is at Shrewsbury House, Bushmoor Crescent, Shooters Hill. 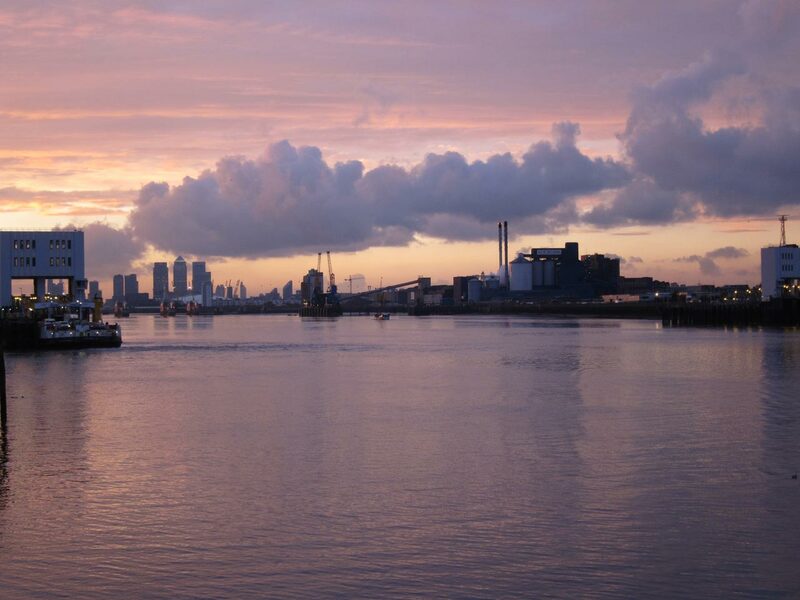 The Greenwich Draft Core Strategy policy protecting local views has been inherited almost unchanged from its predecessor, the Unitary Development Plan. 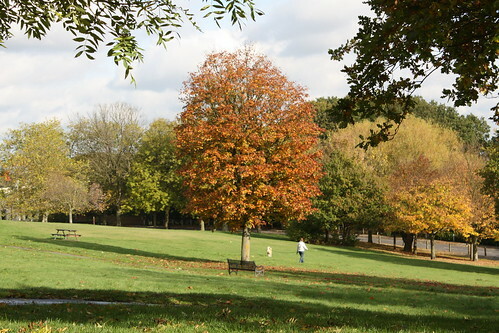 As well as the two “strategic views” of St. Paul’s Cathedral from Greenwich Park and Blackheath Point it provides protection for 11 specified local views, listed below, which are deemed essential to the character of the borough, especially where they include the River Thames and its banks. 11. Millennium Dome from Central Park. Number 12 is the only addition to the list in the Unitary Development Plan. 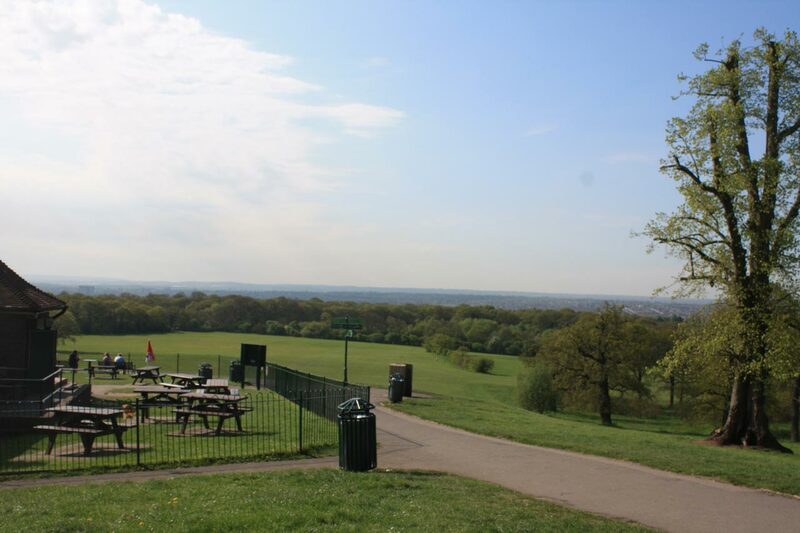 The first four views on the list are from various points on Shooters Hill. 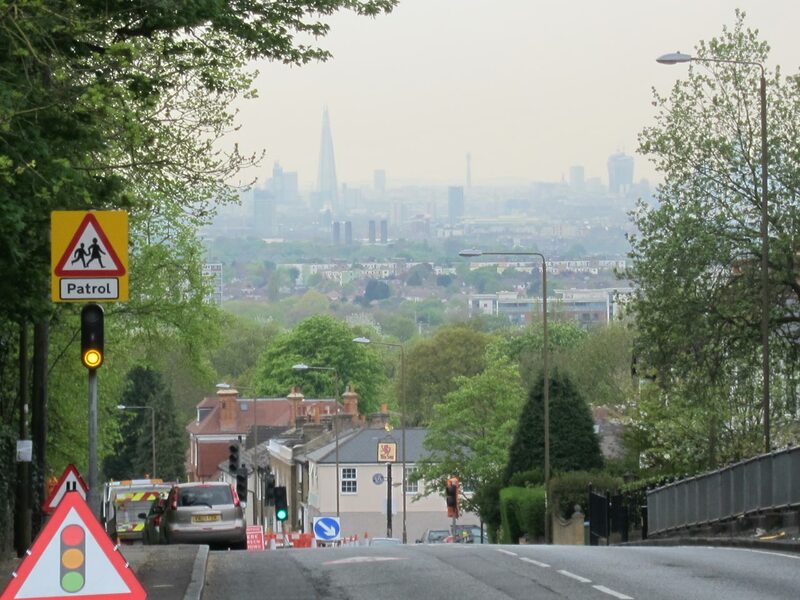 Number 1, Shooters Hill to Central London, is the breathtaking view, now dominated by the distant Shard, towards the iconic skyline of London. I think the panorama is best seen as it is gradually revealed from the upper deck of a number 89 bus, with the Shard and BT Tower first, followed by the emerging Walkie-Talkie and Cheese Grater as you go down the hill. A similar view, and one I find more impressive even though it isn’t listed in the Core Strategy, is that from the top of Occupation Lane towards Central London. Here the horizon stretches from the Strata SE1 building via the London Eye, Guys, the Shard, BT Tower, City of London buildings such as the Walkie-Talkie, Cheese Grater, and Gherkin round to Canary Wharf’s ever multiplying set of towers. 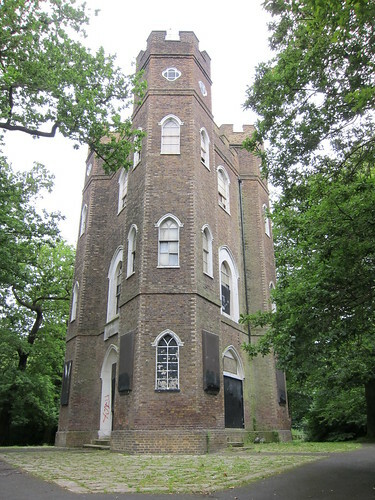 I’m looking forward to the reopening of Severndroog Castle, the panoramic view from the top is just amazing. There are several views from Shrewsbury Park towards the Lower Thames (number 2 on the list). Up at the top of the hill, looking north-west-ish there is a long view over towards Abbey Wood, Dagenham and the rolling hills of Essex beyond. Further round, on the Rowton Road side just up the hill from the allotments there’s the prospect of Woolwich shown below. Over to the left the new, strangely decorated, Tesco-fronted monolith of Woolwich Central has started to spoil the view. To the mid-right the towers over the Crossrail station box are growing, and someday approximately in the centre of the view will be the 21-storey towers of the Berkeley Homes’ Royal Arsenal development. Will this have a “materially adverse effect on the overall perspective and essential quality” of the view? Clearly the Council Planning Committee don’t think so. From the map I think Local View number 3, Castlewood towards S.E. 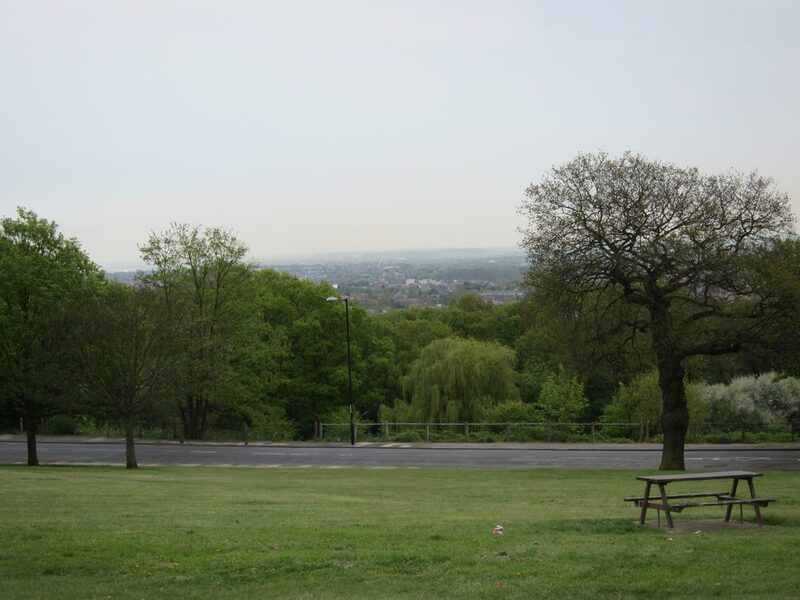 London, is the superb wide-open misty vista, pictured below, from the Oxleas Cafe over a wide area of south-east London and Kent, towards Sidcup and Orpington. 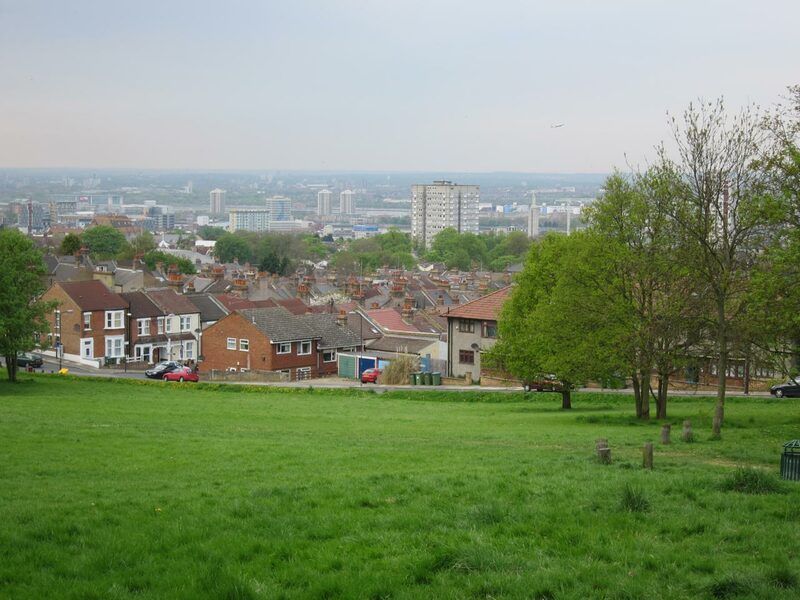 Then there’s the fourth protected view, Eaglesfield Recreation Ground towards Bexley and the Lower Thames, eastwards in the direction of the Dartford Crossing. Should more local views be protected? Does the policy condition that a development should not have a “materially adverse effect on the overall perspective and essential quality” of a view make it clear what’s acceptable? We have until midnight on the 14th May to comment on the Greenwich Draft Core Strategy, which will guide all planning decisions until 2027. This can be done through the council’s consultation portal, or by e-mail to planning-policy@royalgreenwich.gov.uk (ensure you add “in response to Royal Greenwich Core Strategy and Development Management Policies” in the subject section), or by using the council’s representation form. 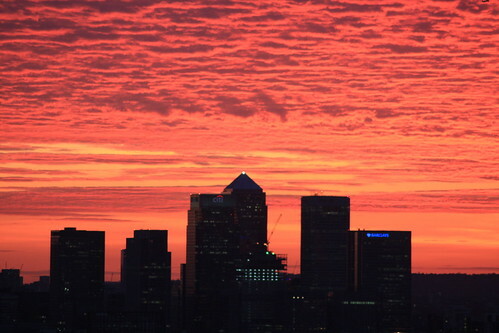 My favourite views from Shooters Hill are the those I can see from my bedroom window, especially the dramatically colourful sunsets over the city such as the one shown below, and the different but equally dramatic colours when the sunrise catches canary wharf’s towers. I don’t think the Planning Inspectorate will allow that in the Core Strategy.